In the late 1960’s and early 1970’s, I watched the CBS Evening News with Walter Cronkite after supper. Cronkite would introduce stories and maps of this area half way around the world called Southeast Asia where the Vietnam War was taking place. He would always include the daily numbers of how many United States soldiers had been killed or wounded in Vietnam for the last day and for the entire conflict. To me, that is what the Vietnam War was…numbers. The Three Soldiers bronze statue overlooking the Wall at the Vietnam Veterans Memorial on the National Mall in Washington, DC. Nikon D700/28-300VR, 1/60s, f/16, ISO 200, EV 0, 50mm focal length. I visited the Vietnam Veterans Memorial in Washington, D. C. for the first time last week. I walked the entire length of the Wall and saw thousands of names engraved into the gabbro stone. The numbers now had names and each name on the Wall meant a soldier had died in Vietnam. 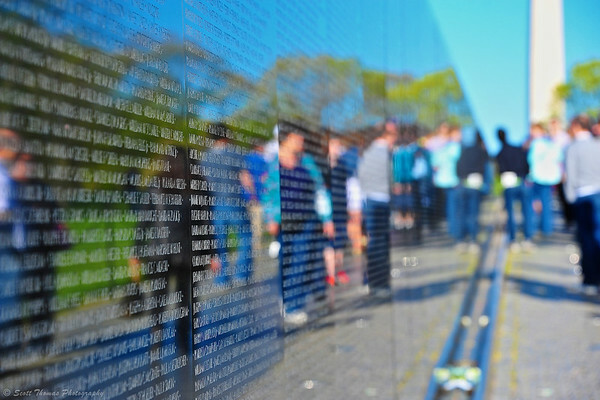 Visitors to the Vietnam Veterans Memorial are reflected in the wall of names on the National Mall in Washington, DC. Nikon D700/28-300VR, 1/250s, f/8, ISO 200, EV 0, 135mm focal length. Each name a son or daughter, friend or spouse, father or mother and all loved by someone. All missed a life beyond their military service. Panel after panel are filled amounting to over 58,000 names. The Vietnam War will never be just numbers to me again. 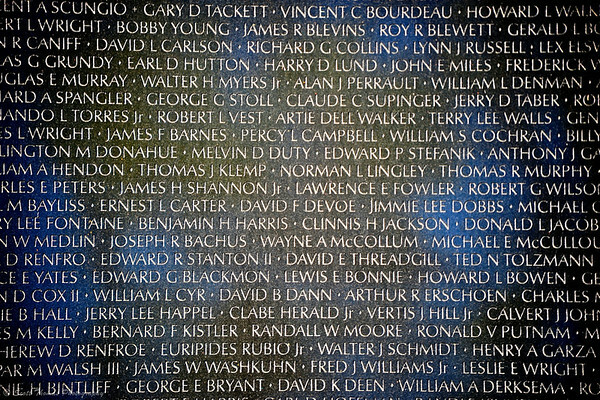 Names engraved into the Vietnam Veterans Memorial on the National Mall in Washington, DC. Nikon D700/28-300VR, 1/125s, f/5.6, ISO 200, EV 0, 300mm focal length. Most people, as I was, are not aware there are two other memorial statues which make up the Vietnam Veterans Memorial. When the Wall was first proposed by designer Maya Lin it was a bit controversial as many wanted a sculpture of soldiers. To satisfy the critics to the Wall, the third place design from the original competition by Fredrick Hart was chosen called The Three Soldiers. 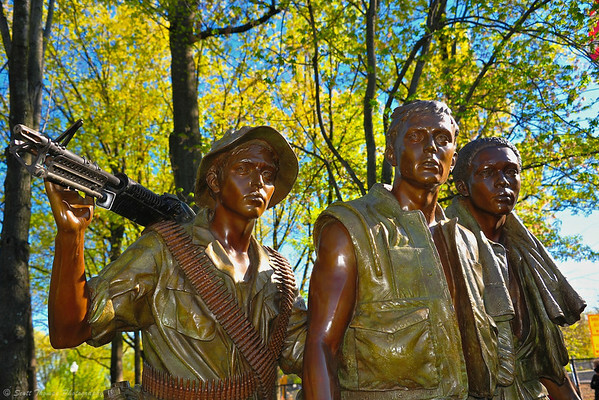 Sculptor Fredrick Hart depicted three soldiers, purposefully identifiable as White American, African American and Hispanic American. 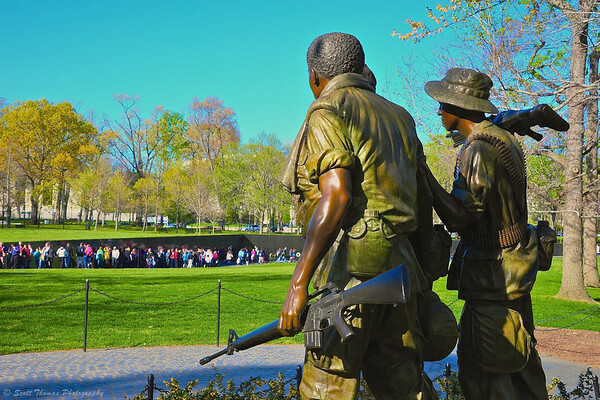 In their final arrangement, the statue and the Wall appear to interact with each other, with the soldiers looking on in solemn tribute at the names of their fallen comrades. Nikon D700/28-300VR, 1/250s, f/6.3, ISO 200, EV 0, 42mm focal length, fill flash at -1 power. In 1993, another statue was added to the Vietnam Veterans Memorial in honor of the women who were a part of the conflict. 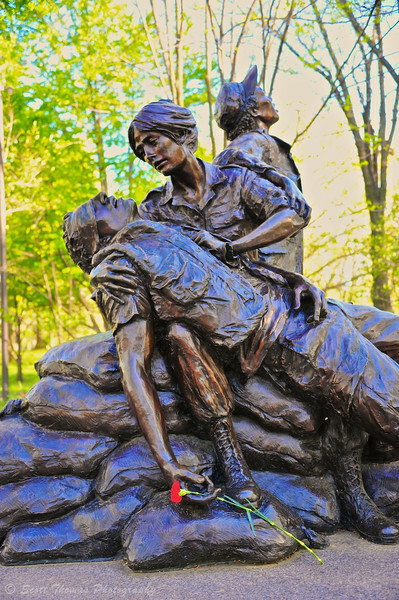 The Women’s Vietnam Memorial statue was designed by Glenna Goodacre. Women's Vietnam Memorial on the National Mall in Washington, DC. Charity is tending to the wounded soldier, Hope is looking up towards the sky and Faith (not shown) is kneeling in prayer. Nikon D700/28-300VR, 1/80s, f/4.2, ISO 200, EV 0, 44mm focal length. This entry was posted in Travel, Weekly View and tagged "washington, 28-300mm, bokeh, charity, dc", flower, hope, national mall, nikon D700, red, reflection, statue, three soldiers, vietnam veterans memorial, vr, wall, women. Bookmark the permalink. Beautiful and this can be sent to some of my email contacts. Thank you Scott. Please, Mike, share this with anyone you wish. Good post, Scott. I wrote and erased half a dozen comments. Someone else already wrote everything I have to say and did it better: Facing It, by Yusef Komunyakaa. I understand the writing and erasing…I did it a few times before the words came to me. That poem is poignant. Having stood in front of the Wall, it really hits home for me. Wonderful shots, Scott. I’m sure it is a very emotional place. Soldiers give all. Not sure I could. Scott, these are beautiful shots. I’ve visited Washington before but not the Vietnam Veterans Memorial. I would love to see that in person.